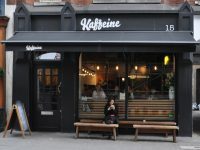 Kaffeine’s second branch is towards the eastern end of Eastcastle Street, five-minute’s walk from the original, with which it shares many features. There’s the black exterior, benches sheltering outside beneath a large, black awning, with “Kaffeine” and the street number written in white above. The original has the door on the right, windows on the left, Eastcastle, which is a shade wider than its parent, reverses this. Inside it’s also slightly bigger and, with its high ceilings and abundant lighting, feels that bit bigger. Another element borrowed from the original is locating the counter on the opposite side from the door. In Eastcastle, you enter on the left, so the counter’s occupies the right-hand wall, leaving just enough space for a five-person window-bar in the floor-to-ceiling windows on the right. The remaining seating’s on the left, a wooden bench running the length of the wall opposite the counter. Anyone who’s been to the original will be familiar with the four narrow, high tables which line the bench, each with an additional two bar stools. In theory each table can seat four, but it’s a real squeeze. Many places would have stopped there, but Kaffeine’s put a pair of narrow two-person bar-style tables in the space in front of the counter. In Kaffeine’s defence, since every table was taken during my visit, the extra tables are needed. However, it does make Eastcastle a very crowded space. The counter’s a thing of immense beauty, clad in brass, which, it turns out, has natural anti-bacterial properties, making it very hygienic. In theory, the layout’s logical since you file past the food, order at the till, then move past (or stop to admire) the Victoria Arduino Black Eagle espresso machine. The retail shelves and water station are at the end of the counter, where you can wait for your order if you’re not staying. Well, that’s the theory. In practice, because of the bar-tables in front of the counter, the flow is very constrained. For example, if people are looking at the cakes, it’s hard to get past to order at the till. Similarly, there’s not a lot of room to wait at the far end, nor is it easy to get out again if the seats are taken or if there’s a queue at the counter. All of this means that Eastcastle is not the most conducive space for lingering, despite its quiet, relaxed atmosphere. On the other hand, if your café’s that small and popular, a regular turnover of customers/tables is no bad thing! Although everything’s packed in, it doesn’t feel that cramped, helped by the tall, exposed ceiling and generous south-facing windows. Beautiful white tiles on three of the four walls (the wall behind the counter is painted black) also help with the feeling of light/space. Even so, the lighting can be subdued, particularly at the back, so the numerous light bulbs are both necessary and welcome. The food is impressive, almost all of which comes from the kitchen downstairs, with the menu changing on a weekly basis. I was there for lunch and had a very fine salad, which comes in a choice of medium or large. You can have any combination of the (three) salads you like, so I combined the char-grilled broccoli (very crunchy) with the steamed leeks with baked eggs (very tasty). The perfect lunch. I’d have liked to try the tasting flight, which consists of a single-shot espresso & single-shot flat white, plus a glass of cascara. Sadly, there wasn’t really time, so I settled for a flat white, expertly-made, the Red Brick holding no surprises. December 2016: Kaffeine Eastcastle has won the 2016 Brian’s Coffee Spot Special Award Award. This entry was posted in Breakfast, Cafes, Cake, Lunch, Sandwiches, West London and tagged include, Square Mile by Brian Williams. Bookmark the permalink.